Gimpel Fils is pleased to announce an exhibition of paintings by the late Scottish artist Alan Davie CBE. From the late 1940's, Davie's artistic career spanned many decades and each has been represented by exhibitions at Gimpel Fils. The exhibition coincides with the gallery's 70th anniversary. For this exhibition we have concentrated on a specific decade, the seventies, a decade in which the artist moved to a new phase. Abstraction no longer dominated and in its place, Alan Davie explored the use of space, making reference to it from two points of view. First, he depicted depth and perspective, using the structures developed during the Renaissance, e.g. converging lines; fore, middle and backgrounds; shading; and the depiction of objects within the painted space. Davie painted a series of works around the theme of 'Ideas for a Children's Wall', which grew out of a mural work he painted for his daughter's room. In 'Setting for the Magician no.2' Davie uses a variety of methods to indicate space, and simultaneously, to undercut such a reading by sowing doubt. There is a room, as indicated by a wall trailing off from another at an angle. One of the walls has a window, but what might be an exterior beyond the window could equally be an interior, because the colour visible through this window is identical to the floor in the foreground. In addition, a quarter moon floats in front of the windowed wall, rather than being visible through it, but then other objects - or are they mere symbols? - float across the canvas, seemingly detached from any link to the imagined space. Thus Alan Davie conjures up a representational image which fails to connect one point of reference to another. We are led to a state of indecision, trying to base a reading of space from an understanding of the conventions used in classical painting, which Davie offers as an initial signpost only to have our understanding confounded by his playful reversals of category: those same categories we use to interpret canonical painted space in historical art. Like Schrodinger's Cat, an Alan Davie space occupies two simultaneous positions, neither of which allows a settled reading. 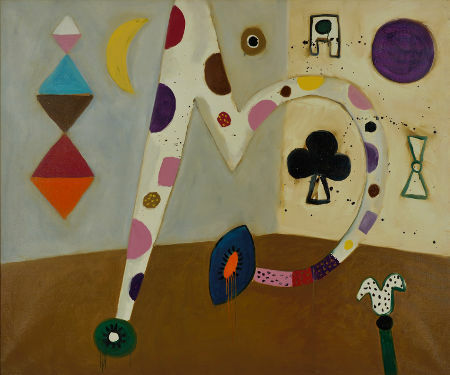 Since the early 1950s Alan Davie's work has regularly been exhibited at Gimpel Fils, other UK locations and in many European galleries. His work is represented in collections including the Tate, Scottish National Gallery, Stedelijk Museum, Amsterdam, Peggy Guggenheim Collection, Venice as well as the Metropolitan Museum and the Museum of Modern Art, New York. In 2013 Davie became a Royal Academician. He died a year later at the age of 93.